Glenn Evans is on trial on charges he put his gun in a man's mouth and held a Taser to his groin. COOK COUNTY CRIMINAL COURTHOUSE — Glenn Evans' defense team on Thursday continued its assault on the Independent Police Review Authority, slamming the oversight agency as "inept, corrupt and comically laughable." 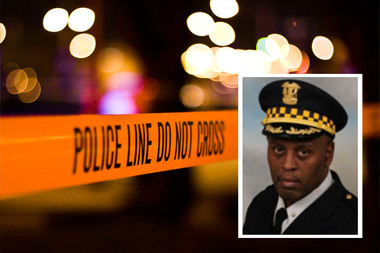 Evans, a 53-year-old Chicago Police commander, is on trial for official misconduct and aggravated battery after Rickey Williams filed a complaint with IPRA claiming Evans shoved a gun in his mouth, held a Taser to his groin and threatened to kill him in 2013. Attorneys presented their final witnesses Thursday, and Cook County Judge Diane Cannon will make a ruling in the bench trial at 10 a.m. Monday. Williams' DNA was found on the barrel of Evans' gun — a fact Assistant State's Attorney Laura Freeman said was not only "a smoking gun" in the case, "It's a smoking freaking cannon." Prosecutors claim Evans mistook a cellphone for a gun when he spotted Williams near a bus stop at 71st and Eberhart about 4:30 p.m. on Jan. 30, 2013. Williams, who testified he's been harassed by police since he picked up a marijuana conviction in 2012, said he got nervous, took off running and hid in a nearby abandoned house. Prosecutors said Evans allegedly attacked Williams while he "demanded to know where the guns are." "There is a clear line between aggression and violence, and judge, the ends do not justify the means," Freeman said during her closing argument Thursday. "Once [police] start breaking the law, they become no better than the criminals they pursue." Evans' defense attorney Laura Morask, during her closing argument, focused on IPRA, the embattled oversight agency that's come under fire for allegations of a cover-up in the Laquan McDonald case. "It cannot be ignored that IPRA was the sole investigating agency" in this case, Morask said. "The display we saw over the last few days is nothing short of disgusting," Morask continued, referring to the at-times bumbling testimony from past and present IPRA employees. "It should be condemned." A few hours earlier, Scott Ando, the former IPRA chief who resigned earlier this week, testified that he ordered IPRA investigators to collect DNA swabs from inside and outside Evans' gun. Only external swabs were collected. Ando also said he asked colleagues to check whether Evans was left- or right-handed, a question that came up multiple times during the three-day trial. Williams initially claimed Evans held his gun in his left hand during the alleged 2013 attack, but switched sides after prosecutors informed him Evans kept his holster on his right hip, according to court testimony. Lead IPRA investigator Vincent Jones said he never checked whether Evans was left- or right-handed. He never interviewed Evans — or any of the officers present on the day in question — because it's IPRA policy to talk to police after criminal proceedings, if criminal charges are filed. The IPRA investigation into Evans continues, Jones said. Ando said he initially kept close tabs on Evans' case because it involved a commander, but left the investigation to IPRA staff. He's never seen Evans' full case file, he testified. "Out of the 2,000 investigations a year, I do not get intimately involved in 2,000 investigations," Ando said. "I think you're expecting me to get into the weeds on every case." According to court testimony, Williams was unable to identify Evans in a photo array in May 2014. Jones testified that the photo used of Evans was taken in November 2004 — more than eight years before the January 2013 altercation. Evans had hair in the photo, but was bald in 2013. Several police officers who were with Evans on Jan. 30, 2013, testified that the commander was not carrying a Taser. Officer Sheila Jackson, who was working in the Grand Crossing District radio room on the day in question, testified this week that Evans did not check out a Taser. But an earlier IPRA report claims Jackson told investigators Evans wouldn't need to check out a Taser because "he's the commander. He can do whatever he wants." Former IPRA investigator Martrice Campbell prepared that report, according to court testimony. Ando said Thursday that Campbell was fired six months ago for allegedly lying in court and perjuring herself on an unrelated case. Campbell admitted in court this week that she wrote that report 15 months after she conducted an unrecorded interview with Jackson. Campbell claimed she took notes during the interview, but they weren't in Evans' file, and Campbell said she believes a supervisor destroyed them. When asked whether the inconsistencies concerned him, Jones, who still serves as lead investigator on Evans' IPRA case said, "No, it didn't concern me." Morask during her closing argument accused Campbell of "manufacturing evidence" because she had an ax to grind with Evans. According to Morask, Campbell was disciplined by Evans when she previously worked under him as a civilian employee with the Police Department. Campbell on Wednesday testified that she didn't know Evans, has never worked with him and has never been disciplined by him. Morask on Thursday said Williams had "5 million reasons to lie" about his interaction with Evans on Jan. 30, 2013, apparently referencing a pending civil suit Williams has with the city. "He embellished, he embroidered and he lied — just like this entire IPRA investigation from start to finish," Morask said, as she pointed to inconsistencies in Williams' testimony. But prosecutors said the inconsistencies didn't outweigh the physical evidence. "No matter how flawed they claim the IPRA investigation to be ... Rickey Williams' DNA was on Glenn Evan's gun. A lot of it," Freeman countered. State Police forensic scientists testified earlier this week that there were two DNA profiles on Evans' gun: one that was too small to test and one that definitely belonged to Williams. Debra Klebacha said that exact profile is estimated to exist only in 1 in 300 quintillion black people. Assistant State's Attorney Amy Watroba said Williams would have to be "the luckiest man alive to ever make a false allegation" against a police officer, to have his DNA appear on the gun. Watroba claimed Evans wiped his gun clean before Internal Affairs called him into police headquarters on Feb. 1, 2013, to test the weapon for DNA. That's why Evans' DNA wasn't found on the gun — an odd occurrence, she said, since he handled it. Williams had left so much DNA behind as the barrel scraped the inside of his mouth, Watroba said, that it was impossible to remove it from all the grooves. The trial comes at a time when the Police Department is under intense national scrutiny amid allegations of cover-ups and police misconduct. Critics of IPRA, from both in and outside the agency, have alleged the investigators are too biased in favor of the police. Two weeks ago, city officials released dashcam footage of a Chicago Police officer shooting 17-year-old Laquan 16 times in October 2014. The footage sparked protests across the city, which led, in part, to the forced resignation of Police Supt. Garry McCarthy and the removal of Ando as IPRA chief. On Monday, the U.S. attorney general announced her office was launching a federal investigation into the Police Department, focusing on "accountability mechanisms" and the department's use of force. That same day, Cook County State's Attorney Anita Alvarez released dashcam footage of a Chicago Police officer fatally shooting Ronald Johnson in October 2014, a week before Laquan was killed. Authorities said Johnson was armed with a 9mm gun with an extended clip, but his family denies that claim and plans to sue the Police Department. What Is That Mysterious Orange Globe in Bartelme Park?